Bain and Gordon..Broony as the Joker..we just need Batman for the set! Just when was Hugh Dallas on Family Fortunes? It’s not such a bad idea to have a lighting system to assist linesmen keep up with play. Scotland’s cheapo version could be fluorescent tubes stuck in the ground at 1 foot intervals behind the ad boards. Shrouded in a larger diameter pipe, with a narrow vertical slit running length-ways, the light would only be visible from directly opposite. Good show, guys. About 27 mins in you talk about educating fans to disregard the SMSM. One step towards this would be to campaign really strongly against buying the Record. I still can’t understand why Tims go anywhere near that toxic rag. Maybe the GB could do a tifo ‘Real Tims Don’t Buy The Record’ or something. Between them and the Scottish BBC we get shat on day in and day out, yet folk still buy and watch material produced by people who hate them. Just think about that … you’re giving your hard earned to folk who hate you. Did we not sign him from Duisburg? Hector Bandido, 7&half-8 out of 10 transfer windae? Spot on about McGregor Hector. He’s miles ahead technically in Scotland and could easily play in Spain Italy or Germany as a Regista. 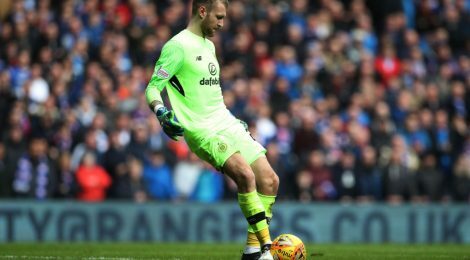 Bain is more suited to playing the Sweeper Keeper role Brendan obviously wants. Bain needed game time and now he has it he’s taken his chance big time. If it’s not broken DONT FIX IT. Morelos defence is surely I got the ball ! I agree, McGregor is brilliant but I think the Scottish Iniesta is a better comparison. Do FIFA/UEFA even know that the Scottish 4/5 referees picked by Hugh Dallas and John Fleming, devote conveniently less than the customary or standard time of a professional referee?